Borrowed from French chef (from the positions of chef d'office and chef de cuisine), from Old French chief (“head, leader”) (English chief), from Vulgar Latin *capum (“head”) (from which also captain, chieftain), from Latin caput (“head”) (English cap (“head covering”)), from Proto-Indo-European *kauput- (English head). When used in reference to a cook with no sous-chefs or other workers beneath him, the term connotes a certain degree of prestige—whether culinary education or ability—distinguishing the chef from a “cook”. As a borrowing, chef was originally italicized, but such treatment is now obsolete. Within a catering establishment, the head cook (and no-one else) will normally be addressed simply as "chef" as a term of respect. From Middle French chief, from Old French chief, from Vulgar Latin *capum, from Latin caput (“head”), from Proto-Italic *kaput, ultimately from Proto-Indo-European *kauput-, *kaput-. Doublet of cap. Les principaux chefs d’une demande. The main points of a request. Le procureur a tenu à refaire une lecture des chefs d’accusation. 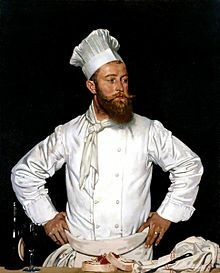 Le Chef de l’Hôtel Chatham, William Orpen, 1921. The pope is the head of the church. Créant dans des établissements de prestige de nombreuses recettes reprises ensuite par d'autres chefs, Escoffier a fait connaitre internationalement la cuisine française. “chef” in le Trésor de la langue française informatisé (The Digitized Treasury of the French Language). From Old French chief, from Latin caput. A leader, boss, or director; a chief official; one in charge. A authority or source of power; something which controls. The main, important or foundational part of something. The upper or topmost portion of something. “chẹ̄f (n.)” in MED Online , Ann Arbor, Mich.: University of Michigan, 2007, retrieved 2018-09-12. Chief, head, top-ranking, executive; being in ultimate control. Principal, foremost, predominant, primary; having the greatest importance. High-quality, outstanding, notable, worthy; deserving recognition. “chẹ̄f (adj. )” in MED Online , Ann Arbor, Mich.: University of Michigan, 2007, retrieved 2018-09-12. “chẹ̄fe (adv. )” in MED Online , Ann Arbor, Mich.: University of Michigan, 2007, retrieved 2018-09-12. From Old French chief, chef, from Vulgar Latin *capum, from Latin caput (“head”), from Proto-Indo-European *kauput-, *kaput-. Borrowed from Turkish kef, keyif. A nu avea chef de ceva. To not feel like/be in the mood for something.